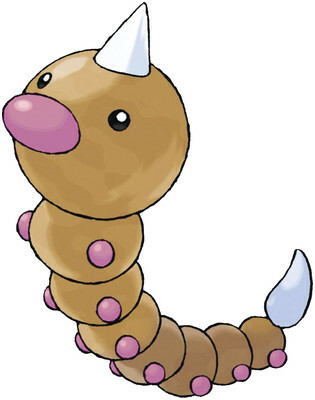 Weedle is a Bug/Poison type Pokémon introduced in Generation 1. It is known as the Hairy Bug Pokémon . The effectiveness of each type on Weedle. In Generation 1, Weedle has a base Special stat of 20. In Generations 1-4, Weedle has a base experience yield of 52. Weedle learns the following moves in Pokémon Let's Go Pikachu & Let's Go Eevee at the levels specified. Weedle does not learn any HMs in Pokémon Let's Go Pikachu & Let's Go Eevee. Weedle learns the following moves in Pokémon Ultra Sun & Ultra Moon at the levels specified. Weedle does not learn any moves by breeding in Pokémon Ultra Sun & Ultra Moon. Weedle does not learn any HMs in Pokémon Ultra Sun & Ultra Moon. Is Weedle added to your Pokedex when the old man shows you how to catch Pokemon in the Kanto Region? Where can I get Weedle in Alpha Sapphire?